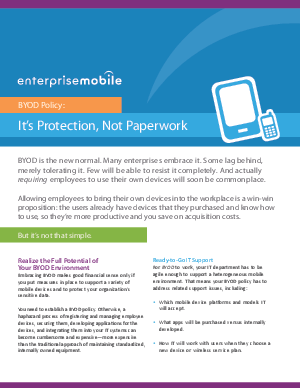 Defining a bring-your-own-device (BYOD) policy for your organization may seem like a big undertaking. That’s why an important part of developing a BYOD policy is to get it right early on. A little guidance can go a long way to making any BYOD strategy work. We’ve taken the guesswork out of the policies, standards, and rules of behavior that employees will have to follow.